During a recent conference on conservation agriculture in the Western Cape, a visiting Australian farmer, Tom Robinson, made the statement that the success of a harvest starts with how the farmer handles the residue during the previous year’s harvest. This is very sound advice and a strategy that has been followed in the long-term crop rotation trials of the Western Cape Department of Agriculture at the Langgewens Research Farm. Several factors play a part in the decision making process during harvesting. These factors include the type of farming system being followed, the harvesting protocol, what type of seeder is used on-farm, weed control and the animal factor. Let us begin with the type of farming system that is implemented on the farm. Conventional or conservation agriculture practices will have different ways of dealing with the wheat residue. In conventional farming practices, all residue will be incorporated into the soil, before the next crop is sown, by the different tillage practices done within this system. It is certainly the easiest way of dealing with your residues, but unfortunately not a sustainable practice with huge amounts of carbon being lost in the form of CO2 during the tillage actions and with that the degradation due to a loss in soil structure. The process leaves the soil bare without any protection against the elements such as rain and wind, which leads to excessive loss of topsoil through erosion, both by water and wind. Conservation agriculture has the opposite in mind, with the retention of residue on top of the soil to prevent erosion, forming a protective layer against the elements. It keeps the soil cooler in summer, which helps protect the important microbial life in the soil. 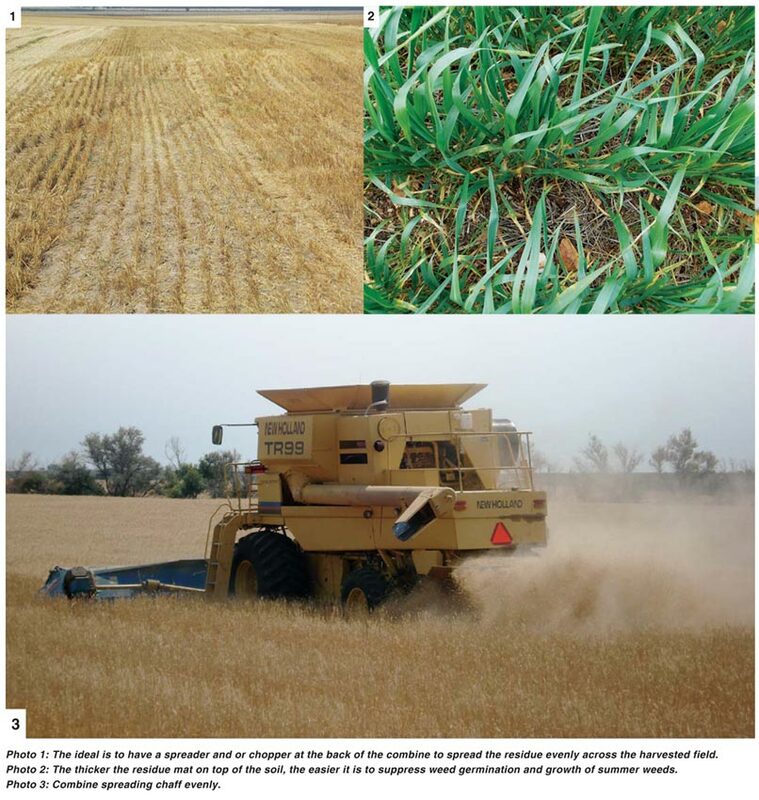 The next factor to play a role is how the wheat is harvested. The type of front you use on your combine will determine if the crop is harvested while lying in windrows or standing up. With harvesting the windrowed crop, this method is mostly used in the southern Cape and in some areas of the Swartland with high wind conditions. The residues are often left in concentrated strips on the harvested field, with the areas in-between left relatively bare. Even harvesting a standing crop could leave areas nearly devoid of residue cover. The ideal is to have a spreader and/or chopper at the back of the combine to spread the residue evenly across the harvested field. The concentration of the chaff part of the residue could cause germination problems when the new crop is established the following season. Some farmers spread the material by dragging old tyres at the back of a tractor. The type of seeder used on the farm will also play an important role in the management of residues following harvest. Currently most farmers in the Western Cape are making use of no-till tine-seeders, which makes it possible to handle crop residues during the seeding process. It also gives the farmer the added advantage to spray pre-emergent herbicide in front of the seeder at planting. The row spacing on these seeders varies between 250 mm and 300 mm in order to handle the residue, otherwise residue can bunch up between the tines and cause poor germination of the crop. The disadvantage of these seeders is that it cannot handle high volumes of residue and therefore the amount of material left on the field before seeding the new crop needs to be decreased by either using it as feed for animals or baling some of the material as hay. With conservation agriculture, aiming to keep as much residues as possible, it might be worth converting to a disk seeder when the amount of material on the soil becomes too much to handle. Single or double disc seeders cuts though the material without disturbing the layer left on top of the soil, whereas a tine-seeder has to be dragged through it. Some local farmers are currently converting to these seeders. There is a school of thought that states that the soil needs to be conditioned (making it easier to plant into) with a tine-seeder for a number of years before switching to a disc-seeder. There is however another school that feels it does not matter which type of seeder you start with. One of the most important factors in postharvest management is the control of weeds. The thicker the residue mat on top of the soil is, the easier it is to suppress weed germination and growth of summer weeds. If too little residue is left on the field it becomes necessary to spray the weeds with the appropriate herbicide to lower the seedbank. The last factor we are going to discuss is the part animals play following harvest – that is if you have animals on the farm. Sheep and cattle can be grazed on the remaining residue following harvest to pick up any wheat kernels or ears that were spilt during the harvesting process and by letting the animals graze the fields during summer, it can help lowering the amount of residue left before the new production season starts. It is important though not to let them consume all the residue, since that will leave soil open to erosion, loss of stored moisture through evaporation and high soil temperatures that kills all soil life. The animals also play a part in controlling weeds, which is an added benefit to the farmer. Remember to manage the residue optimally on your farm to ensure that it makes your production easier and contributes to the sustainability of your farming practice. Directorate Plant Science, Western Cape Department of Agriculture. For more information, send an email to johannst@elsenburg.com.